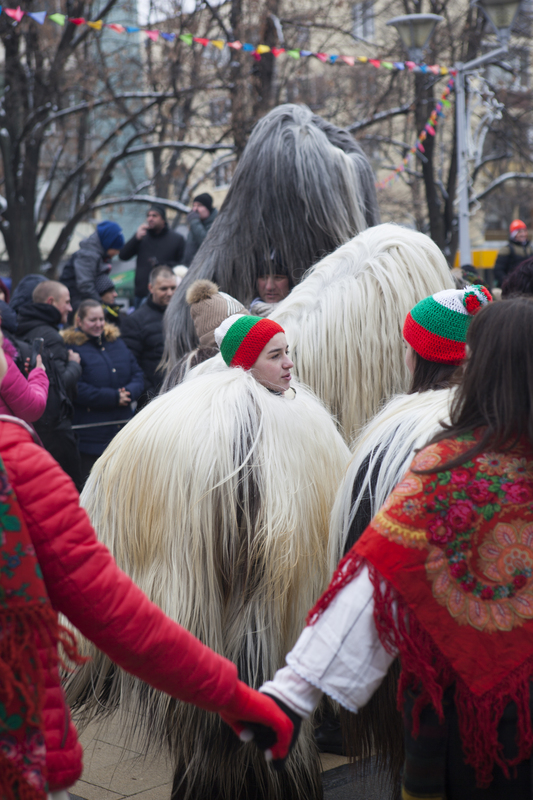 Surva (Bulgarian: Сурва) festival takes place towards the end of January in Pernik, Bulgaria. 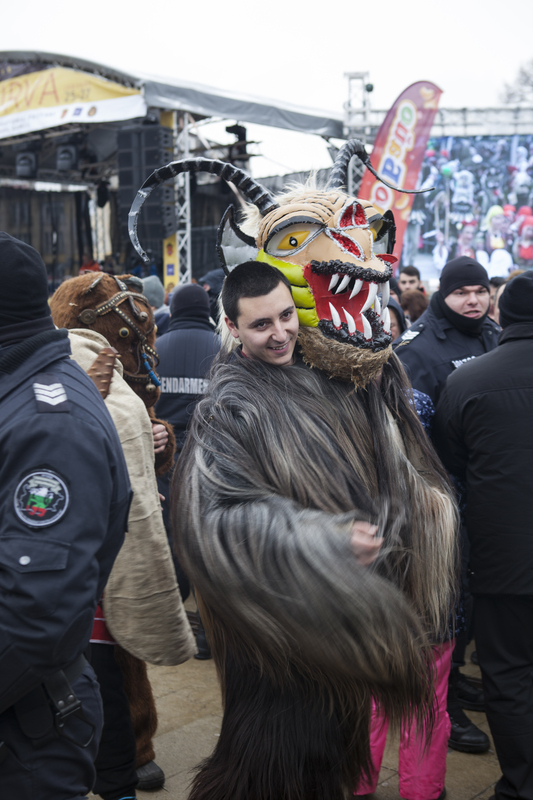 A parade of the kukeri – costumed demons and other figures – is performed, including dancing, music making and pantomimes. 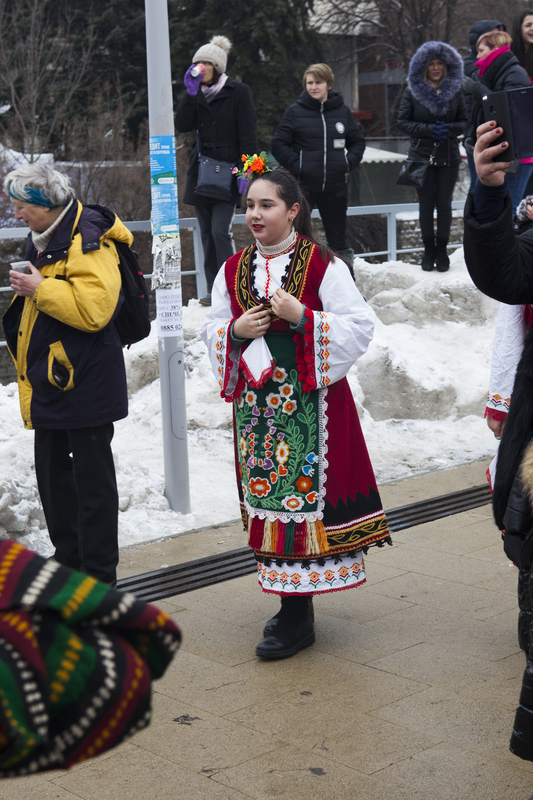 Lots of groups from all over Bulgaria perform their traditional ‘kukeri’ pieces and there is a great variety of styles in costume, dance and what’s included in the performance. Most of the kukeri wear bells, bang drums or blow horns and generally make a lot of noise and look fearsome to scare off the evil spirits and bring in the regeneration of the year. Watching the kukeri, I thought about how these preserved acts of ritual purging and cleansing relate to essential concepts of the human psyche: how to cleanse the demon the human form must also become the demon; how pagan rituals figure the subjugation of the human form to the ruthlessness of nature, and prepare the human and his community for this ruthlessness; and also how they recognise and then recontain the chaos of natural forces. 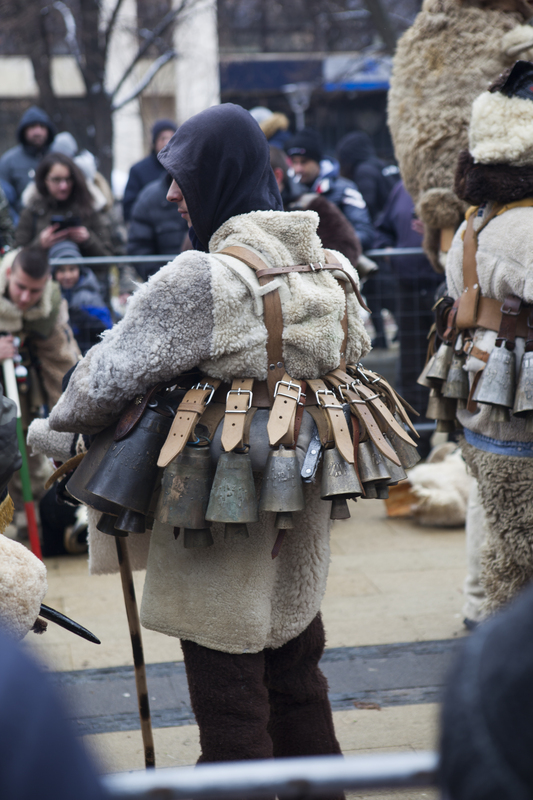 Even in this, much modernised version of the ritual, certain indicators of more violent and wild things remain – the costumes are hot and heavy. 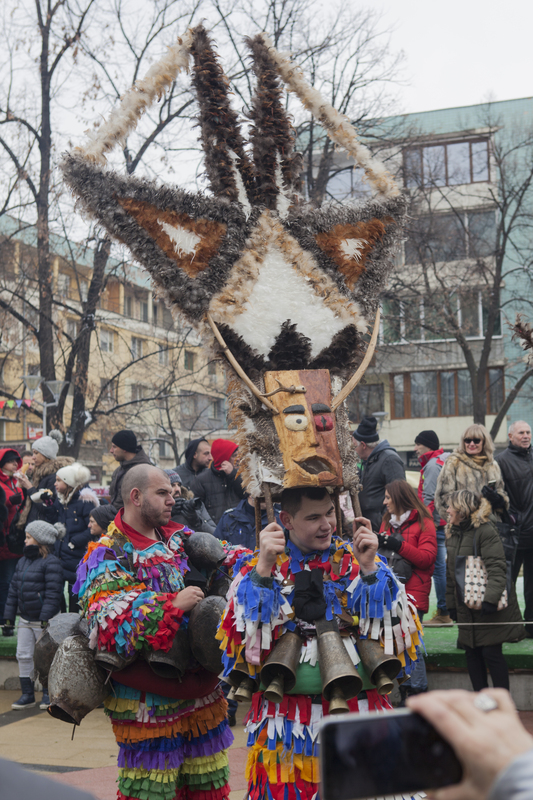 The (mostly) men carry their masks before their performance in the parade square, putting off the moment when they will be encased in thick goat hide or wool or large, hard, wobbling head dresses. You can see performers remove them, panting and sweating, whenever they get a break – their breath steaming in the cold air. This physical effort, whereby the man must carry the burden of his costume and become cocooned in the hot body of the figure he portrays, seems to me to echo something of the necessary pain of purging. It is painful to become the demon and to fight the demon, only the strong can do it, but through pain the relief of a fresh cycle is attained – like a body fighting infection through fever. What this also darkly hints at, I suppose, is the possibility that this battle is lost – that unwilling sacrifices are made to the demon, bodies are lost in the fight to overcome the old year and all it implies about death, retrogradation, and fear of apocalypse. What if the new year just simply doesn’t come? 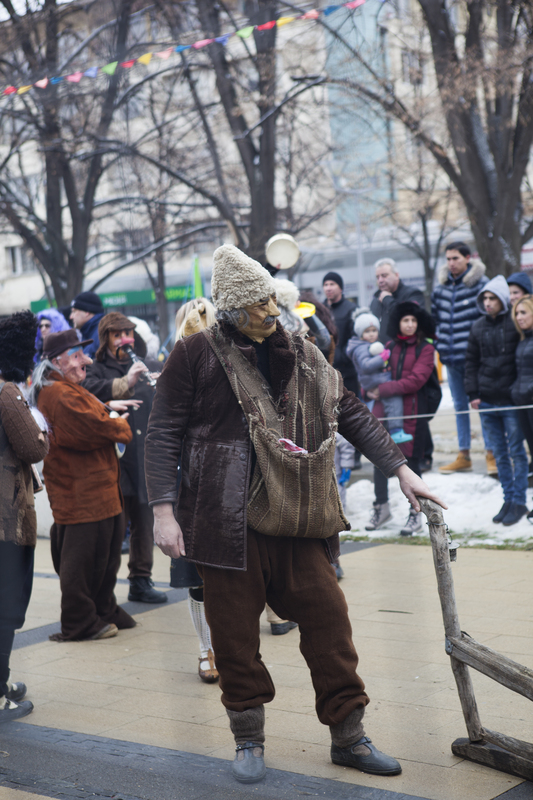 Some of the village or regional groups included plays in the performance. In one of these, a gallows was wheeled into the square. 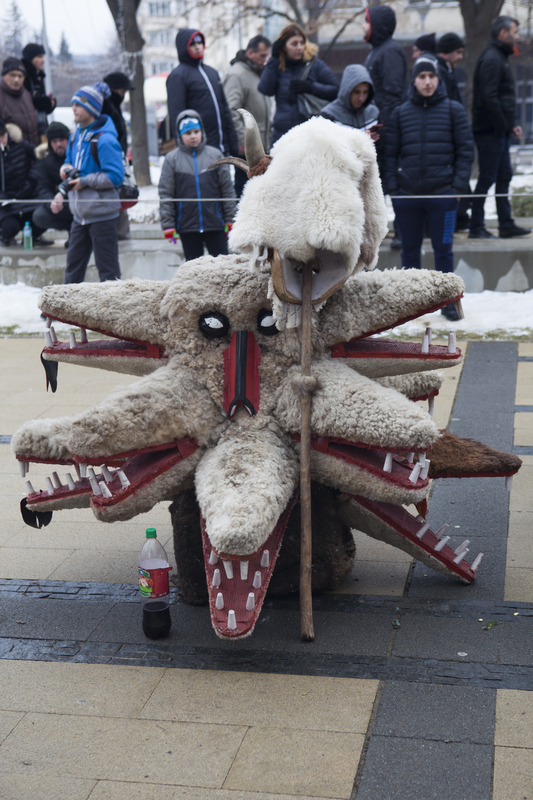 The kukeri danced around it, and around a priest, a doctor, a plough and a host of other figures and roles. Eventually, some guards caught a kuker and strung him up in the gallows, they then hoisted him so that he hung from a noose, swinging. 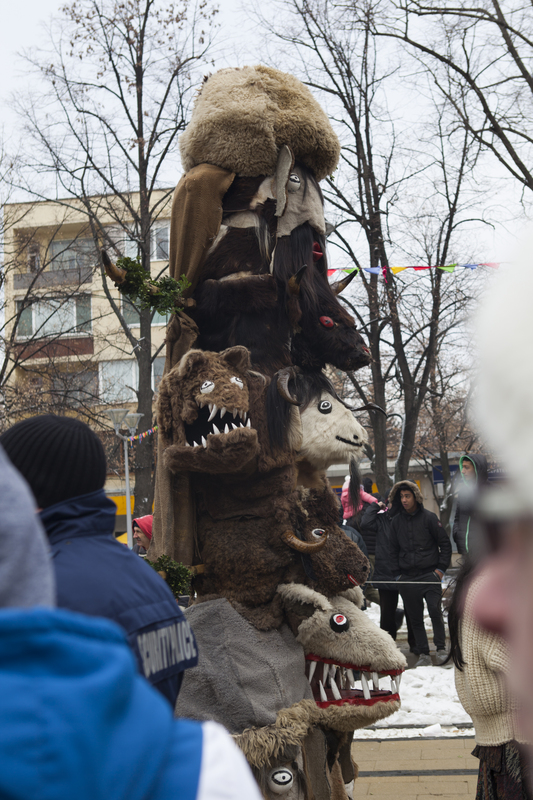 The other kukeri lined up and the priest blessed each one. Finally, each kuker knelt down, their sword tips pointing into the ground. The women (who are often men dressed up as women) threw grain. The kukeri, my interpretation is, were defeated and the life of the new season could come. The crowds jostled, took thousands of photos and videos on their phones. 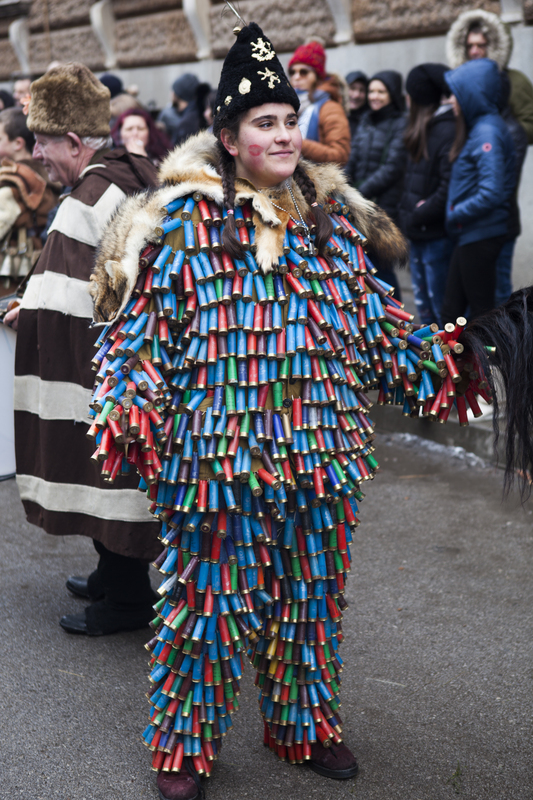 They ate spit-roasted pork, hot dogs, and red sugar lolly pops in the shape of chickens or hands from the many stands arround the parade square. The air smelt of cigarette smoke, burnt sugar, hot fat, and sometimes sweet spices. A woman continually read numbers over the loud speaker, which were in fact vote-by-text numbers for each audience member to vote for their favourite performance group. (At the time of writing, the second day of the festival, the online tally shows that Kaynardja village is winning with 18% of the vote.) A very cold wind was blowing which threw about the feathers of the many dream-catchers for sale from souvenir stands. Small children were crying, overwhelmed. Eventually, my feet and hands went numb. I watched more of the festival via their live Youtube video. 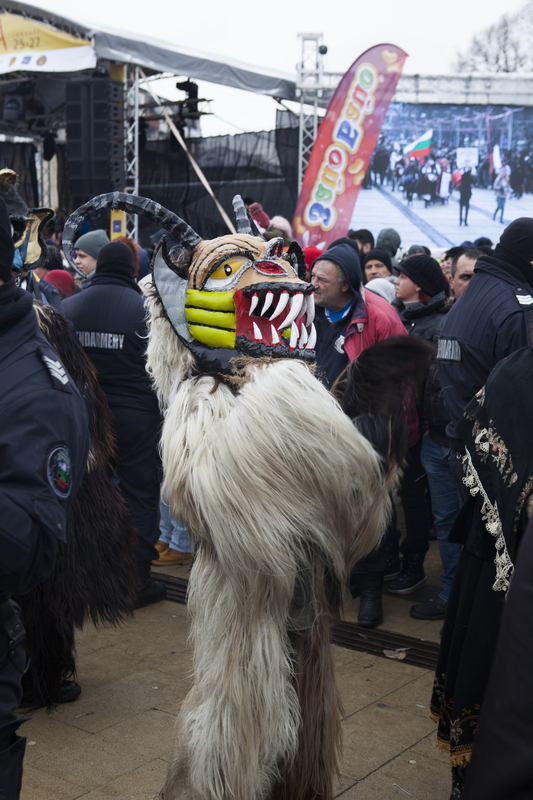 Which, I think, poses the question: can a live broadcast of the kukeri also scare off the demons from a remote location? Maybe it works best if it is played at full volume so that the cacophany of bells and horns can be heard – echoing and warding off the chaos of the demonic. Surely not, though, for embodiment is key to the ritual. Man becoming demon, with all the suspension of rules and norms that implies, must necessarily be an embodied experience. Afterall, in latent, unembodied concept it exists everywhere. The ritual asks us to look the demon in the face because most of life is about keeping the demon – the darker fears and desires of the human, the greater strength of nature and time – out of sight. 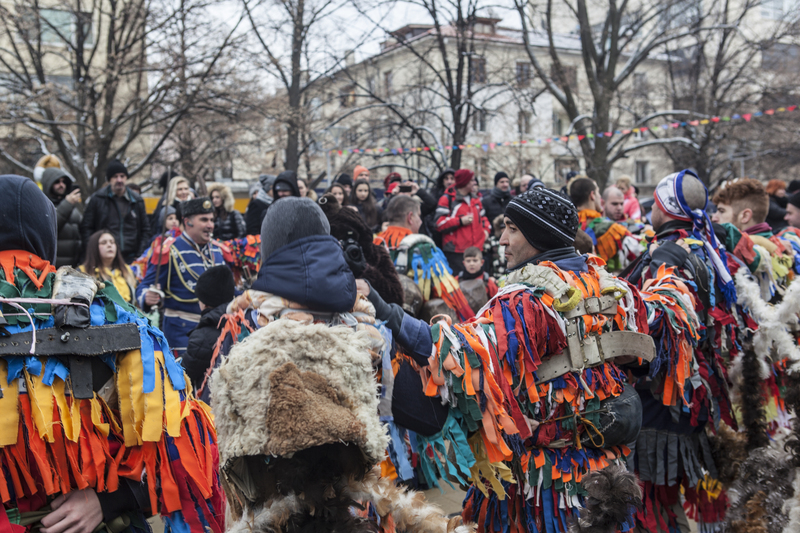 The parade in Pernik exists in a strangely ambiguous zone then – as perhaps all rituals do: releasing the chaotic and containing it at the same time. It is a highly partial sight of the demon, more partial than it would have been in a village run riot with men who were no longer themselves and no longer responsible to the normal rules, and hugely more partial than whatever original rites it references which are lost in pre-history and the unconscious. 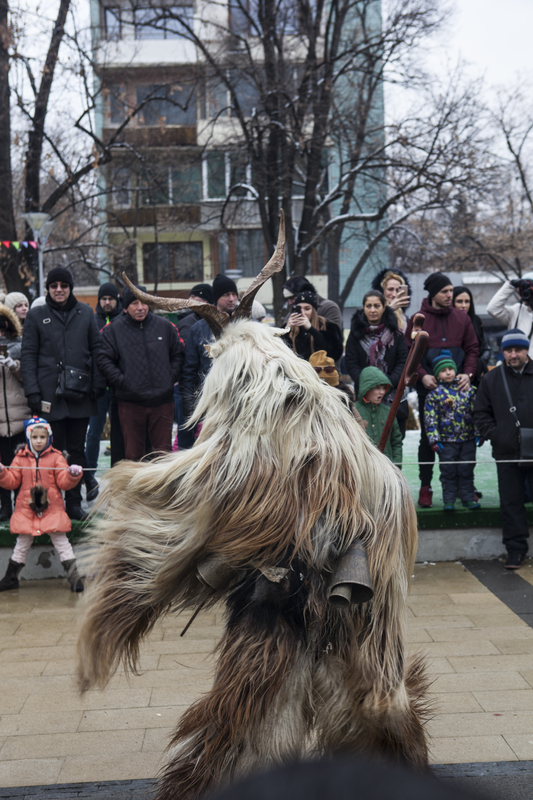 The demon at Pernik is pushed into latency by civilisation, tourism, leisure and consumerism. It is contained in civil parameters: the fence that lines the paradeway, the democratic voting system, the holiday souvenirs. But it is also an echo of something much darker and stranger, something that exists in each community and was important enough to be granted and re-contained every year, for fear it might otherwise spring out and create chaos and stall, or even destroy, the rightful passage of time.